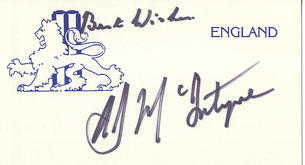 This is a Hand Signed White Card 3.5" x 2" by the late Surrey and England Cricketer who played in 3 Test Matches for his Country. Arthur John William McIntyre (14 May 1918 - 26 December 2009) was an English cricketer. A wicket-keeper, he was an integral part of the Surrey side that won the County Championship in every season from 1952 to 1958 inclusive, and played in three Tests for the English cricket team, two in 1950 and one in 1955. According to McIntyre's obituary in the Daily Telegraph, Peter May wrote: "Godfrey Evans could touch great heights of wicketkeeping but day in, day out, Arthur was the most reliable wicketkeeper of the 1950s... He should have kept many times for England."